University of Cincinnati researchers say they have found a solution to one of the biggest environmental problems facing the energy industry: water consumption. Power plants in the United States need as much water each year as all of the nation’s farms combined – an estimated 133 billion gallons per day, according to federal numbers. This poses an enormous strain on water resources and has a detrimental environmental impact. But Raj Manglik and Milind A. Jog, professors of mechanical engineering in UC’s College of Engineering and Applied Science, say they have developed a new air-cooling system for power plants that uses no water but is nearly as effective as water-cooled systems. The project was funded by a $3.4 million grant from the U.S. Department of Energy. It demonstrates the impact the university's commitment to research is having in the world as part of UC's strategic direction called Next Lives Here. The two researchers used their backgrounds in experimental heat transfer, computational modeling and fluid dynamics to design a better air-cooled condenser for power plants. 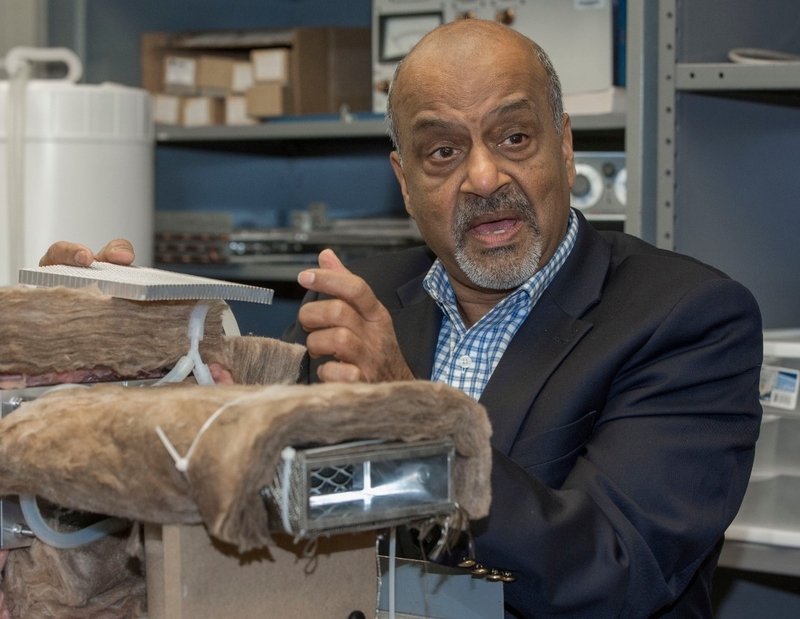 Like the radiator of a car, the condenser has a meshwork of metal fins specially designed by UC’s researchers to draw heat away in the circulated air. Modeling helps us understand the physics. Experiments give us the results that can be used to optimize design. UC’s researchers developed enhanced metal fins with a unique geometric design that favorably alters the air flow over them. This provides far better heat convection to cool the steam in the air-cooled condenser. “The flow of air gets disrupted with more mixing and more efficient heat transfer compared to traditional fins used on these air-cooled condensers,” Jog said. Manglik said there was no single “Eureka!” moment but rather deliberate improvements over time. Shedding more heat increases the efficiency of the power plants, which means they can produce more electricity. And since the cooling system is more effective, it doesn’t have to be as big and costly to build, they said. Laboratory scale tests suggested the researchers’ system can reduce the cooling temperature from today’s 140 degrees to as low as 115 degrees. UC doctoral students Kuan-Ting Lin and Dantong Shi tested a small prototype in an engineering lab. Now UC is partnering with Taneytown, Md., company Evapco on a largescale prototype test of the design at the company’s labs. But UC’s engineers didn’t stop with condenser fins. They also are working on a solution to one of the energy industry’s biggest conundrums. In the summer, electricity demand typically peaks during the hottest part of the day when a plant’s cooling systems are least efficient. Jog and Manglik are developing a better system to pre-cool the circulated air using a heat sink that captures cooler temperatures at night. UC’s researchers also are working with Babcock and Wilcox, in Lancaster, Ohio, which in 2016 acquired the Italian company SPIG specializing in power plant cooling systems. Manglik said air-cooled power plants will become increasingly valuable in arid parts of the world in the face of growing industrialization and climate change. The researchers have been working on patenting their ideas since submitting their grant proposal in 2015. Manglik said their results of their full-scale experiments will have to be persuasive. The two researchers have collaborated on diverse research projects at UC over the past decade. “I think that synergy makes it work,” Jog said. The University of Cincinnati is classified as a Research 1 institution by the Carnegie Commission and is ranked in the National Science Foundation's Top-35 public research universities. UC's graduate students and faculty investigate problems and innovate solutions with real-world impact. Next Lives Here.